Housed in the Chapter Library is a book once owned by Henry VIII’s first wife, Katherine of Aragon. Printed in Antwerp in 1529, the book is by Joannes Ludovicus Vives (1493-1540) and is titled De concordia et discordia in humano genere (On concord and discord in humankind). Juan Luis Vives was born in Valencia, Spain, to converted Jewish cloth merchants. He left for Paris in 1509, possibly to escape the Spanish Inquisition which would eventually claim the lives of his parents. He would never return to his native country. He came to England in 1523 with the aid of Thomas More to seek the patronage of Henry VIII, to whom Vives dedicated his edition of St Augustine’s De civitate Dei (City of God).Received well at court, he became tutor to Princess Mary, writing a treatise on the education of Christian women, De institutione feminae Christianae, which he dedicated to Katherine. He also found favour with Cardinal Wolsey, who appointed him his Reader in Humanity at Oxford. However this changed in 1528 when Vives supported Katherine over the divorce; as her friend and spiritual advisor, he was accused of assisting her and was placed under house arrest. Upon his release, he returned to Bruges and was cut off by Katherine after refusing to counsel her further. In De Concordia Vives discusses peace in Europe and the war against the Turks. This piece of social criticism emphasised the value of peace and the absurdity of war, advancing the idea of a League of Nations as the only remedy for preventing aggressive wars among nations. In it, Vives asserts that the first aim and object of all governing bodies must be the welfare of their people. 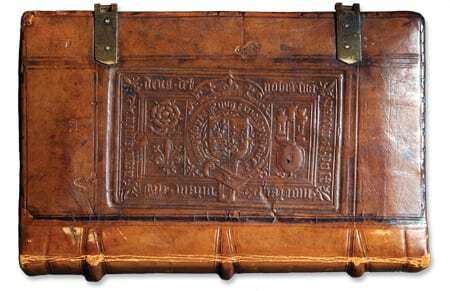 The volume in the Chapter Library is bound in tooled leather bearing the arms of Henry VIII, Katherine’s personal emblem, the pomegranate, and the arms of Castile.